While we were at it we steam cleaned all the furniture as well. Area rugs were not left out. Hubby and I rolled them up then moved them to the driveway for some redneck steam cleaning :) It was so nice to start the holiday off with fresh furniture and carpets. The savings were over the top, companies want an arm and a leg for furniture cleaning! This is a must try recipe for Amish Cinnamon Bread, SOOOOO yummy. These loaves didn't last long, I need to whip up another batch for these cold dreary days, paired with a cup of tea it can't be beat. One of the many activities we did over Thanksgiving was to have a blast with family photo's from Hubby's Sister she brought along for me to scan. This one is of bubba's Mom and Dad when they first meet. 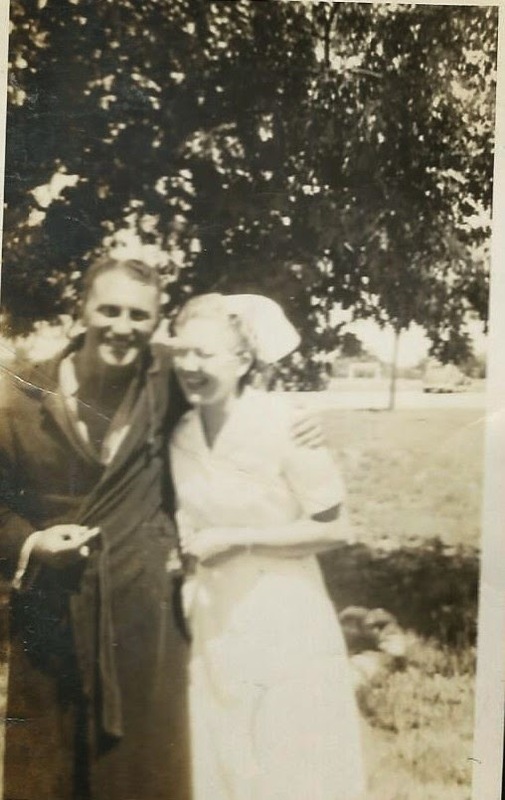 Ma was a nurse in the Army, Dad was one of her many patients. 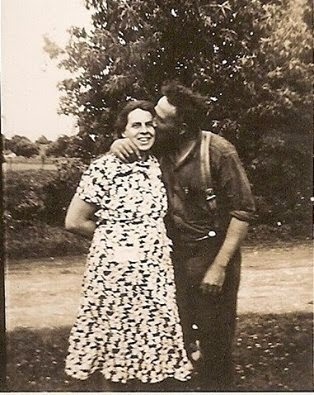 Here is another of Hubby's Grandma and Papaw. I am still working the candle at both ends due to all the activities over Thanksgiving but I wouldn't trade the fun for a million bucks :) One of the biggies was to scan in all of Hubby's old family photo's his Sister shared with us, also to get the names, dates, and story behind each of the photo's. I did my families heritage album some years back with my Aunt when she was first diagnosed with Alzheimer's. Each time we made a visit back to IN I would scan, print, and get the story of old photo's she had. The next visit was to share the pages I had made with her before we got started on more photo's. We worked on this album for close to 3 years together...long distance for the most part. There were many times my Aunt couldn't tell you what she ate for lunch or if she had even eaten lunch, she didn't always recognize her Husband, or how to put her clothes on but one thing she did remember was the old days and every single person in every single photo. It was amazing!!!! Another BIG activity we all participated in during Thanksgiving was to set up a Group FB page for hubby's family. One of my cousins had done this over the summer for our family to share old family photo's talk about COOL!!!! I set the page up the night before Thanksgiving but waited until Thanksgiving day to invite everyone to the page, during the day we posted a few photo's with the story behind the photo. By that evening I think everyone in hubby's family was on FB sharing sweet stories and memories. Double way COOL. The next evening one of hubby's cousins had his Mom and Dad (he is 80 now the last in the family of 6) over to share leftovers and let them look at the posts, they took it a step farther by video taping Uncle Ike and Aunt Phyllis reaction while viewing the page. Over the top COOL!!!!! So here is something to add to your must do list :) Get your old family photo's scanned!! Don't have a scanner? What a great gift to ask Santa for, or you can take the whole pile to Walgreen's, CVS, etc and do your scanning there. Set your family up a group FB page and share the fun, encourage everyone to join in so you will have your families memories preserved all in one spot :) It's like having a family reunion but you are setting on the sofa in your PJ's. Added bonus you won't have the expense of travel nor do you have to worry about those extra pounds you put on during the holiday's.